Velma Taylor 81 of Benton Harbor, transitioned on September 7, 2018, at Hanson Hospice Center in Stevensville, MI. Legacy farewell services will be held on September 14, 2018, at Ebenezer Baptist Church, 214 E Britain Ave, Benton Harbor, MI 49022 with visitation starting at 10:00 am followed by service at 11:00 am. Mother Velma Taylor 81 made her earthly transition to heavenly glory on September 7, 2018. She was born on September 18, 1936, to William and Berda Hickman in Louisville Mississippi. Mother Velma Taylor confessed her belief in Christ at an early age. In 1949 her family relocated to Osceola Arkansas where she later met the late Willie B. Taylor and on April 23, 1953, they became as one. In 1964 they moved to Benton Harbor. In 1998 she retired from Lakeland Hospital after rendering 30 years of service. Mother Taylor enjoyed traveling, walking, cooking, singing in the choir, and was known for wearing her fancy hats. She also enjoyed her two dogs, “Bo and Mo”. She was a member of the Easter star, Red Hatters, Mission Ministry and served on the Mother’s Board until her health failed her. She was known as a quiet, soft-spoken, and nurturing woman. Mother Taylor is proceeded in death by her parents William and Berda Hickman, sibling Jessie James Hickman, Kelly O Grad’y, Daisy Rodgers, Hattie Hickman, James Lee Hickman, Flora Williams, Eddie Haynes, and Lula Jackson. Mother Taylor is survived by her five children Shirley (James) Higgs of Kansas City MO, Margaret (Rev Brian) Clayborn, of Bento Harbor, MI, Karl Terry Taylor, of Chicago IL, Rickey (Cynthia) Taylor of South Bend IN, and Patricia Ann Taylor (fiancé Willie) of Benton Harbor, MI. 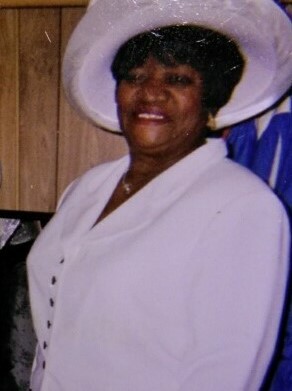 9 grandchildren, 13 great-grandchildren, she is also survived by her 4 sisters-in-law, Bertha Burton, Margared Drummer, Juanita Lowery, all of Chicago IL, and Eula Taylor of Benton Harbor. 6 God-daughters Shirley Anderson, Pat Kyle, Sandra Williams, Alfrieda McCoy, and Hazel Griffin, Quianna Bennett, and 1 godson Joe Griffin. Her caregivers in the time of need were Ruby Benjamin, Faith Bennett, Coreen Wilburn, Margaret Willis, and Paulette Jefferson, she also leaves a host of nieces, nephews, family, and friends.